Cinco de Mayo literally means May 5th. On May 5, 1862, the smaller Mexican army defeated the more-powerful French invading army at the Battle of Puebla. This victory was important because it greatly bolstered the morale and patriotic pride of the Mexican people at the time. 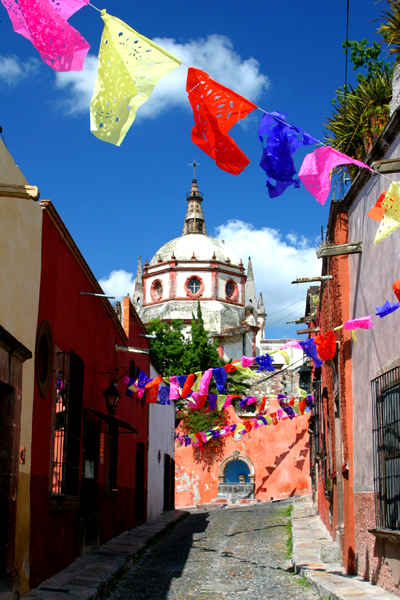 In Mexico, the biggest Cinco de Mayo celebration is in the province of Puebla, where the historic battle took place. Cinco De Mayo is more widely celebrated in the US than in Mexico! Cinco de Mayo is not to be confused with Mexico's Independence Day, which is celebrated on September 16 each year. Cinco De Mayo was not a holiday on my radar until I met my husband. While his appearance might suggest otherwise, part of his heritage is Mexican. This side of his family lives in Texas today. When my husband and I were married, I wanted to celebrate this heritage! Together we decided to celebrate Cinco De Mayo each year. What is Cinco De Mayo? A brief, but helpful overview. Puebla, Mexico is located southeast of Mexico City (the capital of Mexico). The city was founded in 1531 and is the largest in the state of Puebla. It is where the Battle of Puebla took place on May 5, 1862. Even the Little Ones Can Celebrate! Try a new Mexican recipe. Find Mexico on the map with your children. Read some of the names of its cities and bodies of water. Compare it in size to other countries. Reach out to anyone you know who is Mexican and ask them to share about their memories of their home. Learn a few new Spanish words. Try using them in conversation. Looking for a few new ones to try? Check out our table below. Before beginning your Cinco De Mayo celebration meal, why not set the tone in your home by making an authentic Mexican traditional art: papel picado? You probably have all the materials you need already. Find that red, green, and white tissue paper you saved from Christmas (or any color you like), scissors, a little yarn, twine, or ribbon, and a stapler or tape! If you've cut paper snowflakes before, this will be a cinch for you! 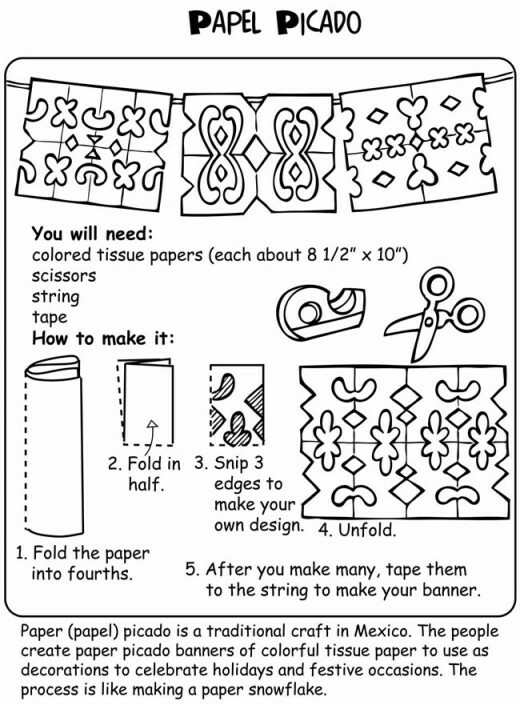 Making papel picado is a fun activity to do with kids of all ages (well, as long as your child is able to use scissors, that is). 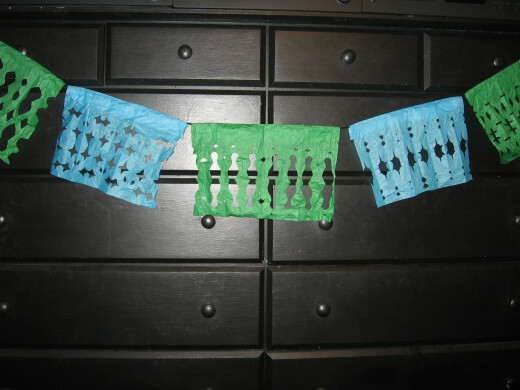 You can make your papel picado as simple or complex as you'd like. The fun is simply in unfolding the tissue paper and seeing what your design looks like! Papel picado iterally means "perforated paper". 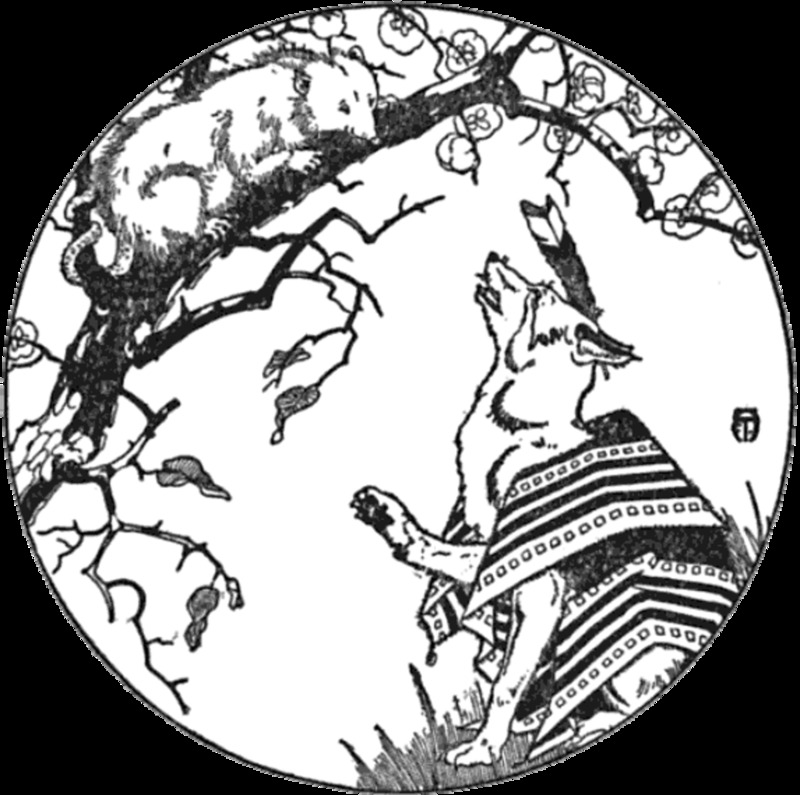 It is considered traditional Mexican Folk Art. 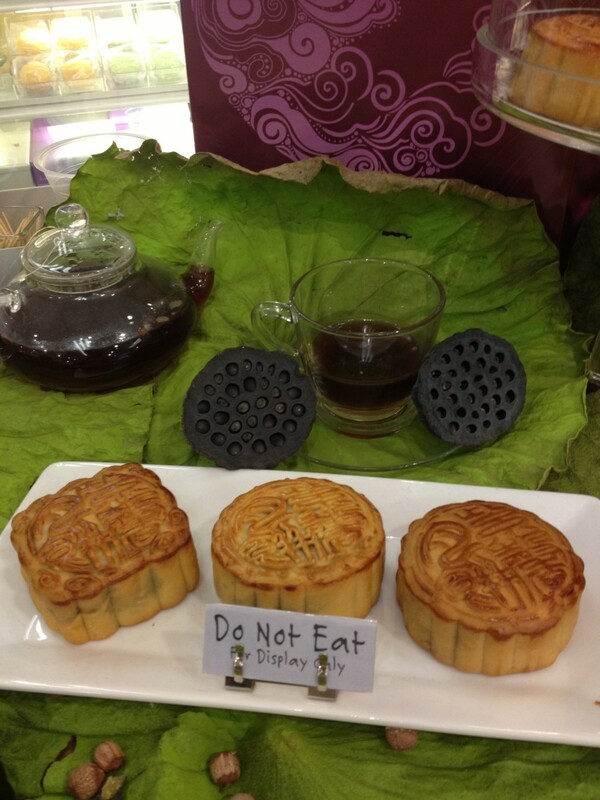 Traditionally, it is made with stacked tissue paper and chisels. However, it can also be made by folding paper and cutting it with scissors (as we like to do). Papel picados are not limited to Cinco De Mayo. This beautiful decoration is also used for other holidays and special events such as weddings and baptisms. Specific colors are traditionally used for specific holidays. For example: Easter (shades of purple), Independence Day (red, green, white), Day of the Dead (purple, pink, orange), and Christmas (rainbow hues). Now, On to Our Delicious Meal! First Up: Salsa! What is your preferred level of salsa spiciness? It seems everyone I have ever eaten Mexican food with has a preference on what kind of salsa tastes best! Some like it smooth (like my husband) and others chunky (like me). Some do not like chunks of onions and peppers (my husband) and others do (me). And what about spice level? Mild, medium, hot, or extra hot? Regardless of your preferences, I can safely say that homemade salsa is so much better than jarred salsa! And, in my opinion, the most important ingredient is...fresh cilantro! 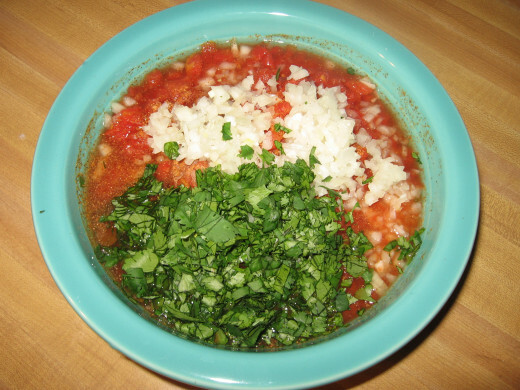 Other ingredients are negotiable, but you simply cannot make fresh salsa without fresh cilantro. This salsa is great for dipping with chips, but 1 cup of it will also be used in the main course: Chicken Tinga Bowls. Gather these 7 ingredients to make your salsa. The shortcut here is using canned diced tomatoes. This saves the time of dicing them yourself! Mince the onions. Or, if you prefer, you can grate them instead. Roughly chop a handful of cilantro. There is no substitute for fresh cilantro! It MAKES the salsa! Pour all the ingredients into a bowl. Mix all the ingredients together. Look: Salsa! Pour the can of tomatoes into a bowl. 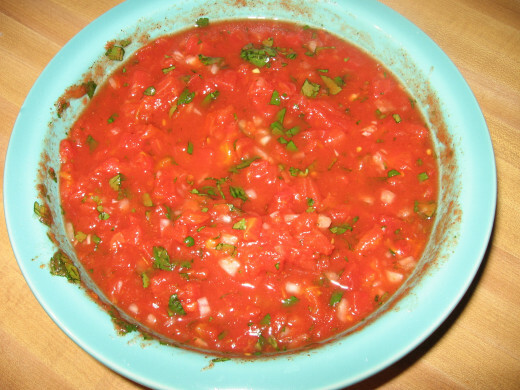 If you prefer your salsa to be a little thicker, you could strain the tomatoes first. We do not do this, but it is an option for you. Add the cayenne pepper (amount at your discretion), lemon juice, vinegar and salt. Mince the onion. (If you prefer less chunks, use a grater. If you prefer more chunks, dice instead of mince). Add to the bowl. Chop the cilantro. 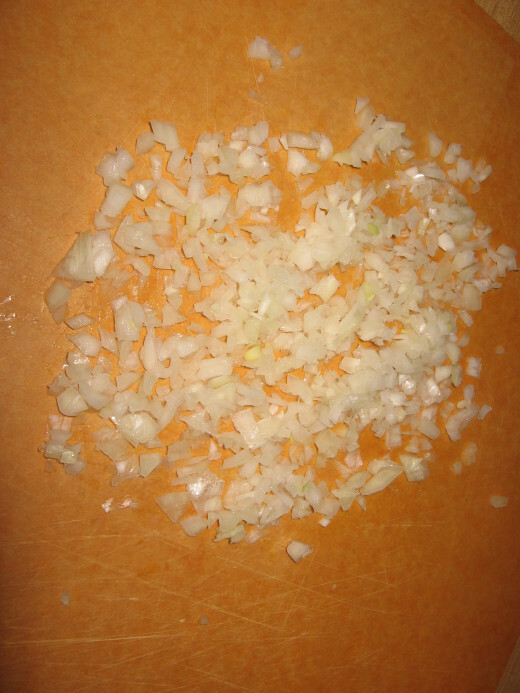 To do this, I place the handful on a cutting board I just used to mince the onions. Using a large sharp knife, rock the knife back and forth keeping one hand on the handle and the other flat on the top of the knife. 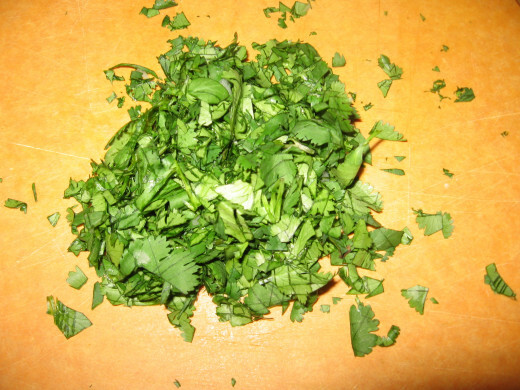 Once you have "ran your knife" through, push the cilantro back into a pile, turn your cutting board, and do the same thing in the opposite direction. Repeat as needed. Add to the bowl. Mix all the tasty ingredients together. That's it! 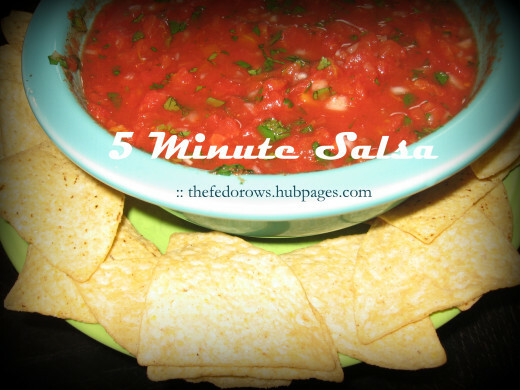 Note: This salsa tastes even better as it sits in the fridge a few days! While you are chopping: If you're going to make guacamole too, chop a little extra onion and cilantro while you're at it. 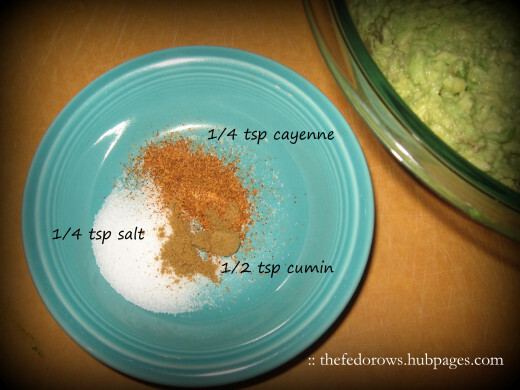 Substitute a jalapeno pepper for the cayenne pepper. Add a diced small green bell pepper. Blend all the ingredients in a blender to make them very smooth. Add a little fresh garlic or garlic powder. Of Course, We Must Have Guacamole Too! While I don't have a morter and pestle yet, this one is on my wish list! Guacamole is originally thought to be created by the Aztecs in Mexico. They sure were smart! There is nothing quite like this deliciously smooth dip. 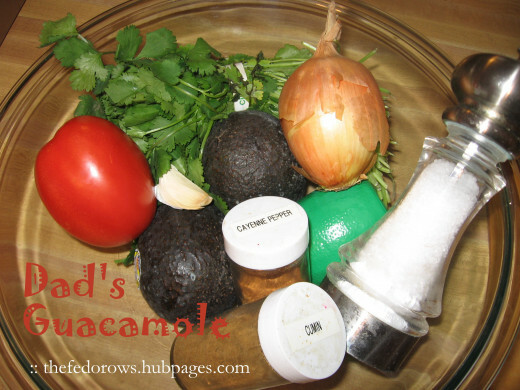 Traditional guacamole has just two ingredients: avacado and sea salt. The ingredients are mashed together in a molcajete (morter and pestle). 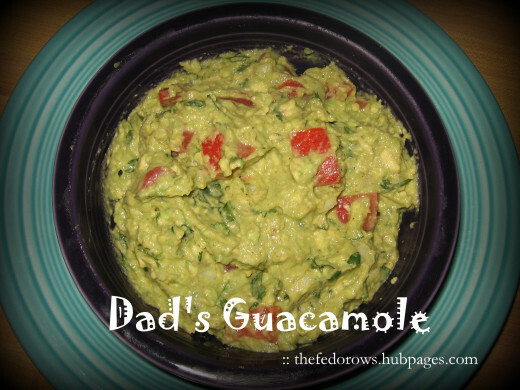 However, "Dad's Guacamole" recipe is the best, in my opinion, as it is the one my Dad and I tweaked over the years! We add a few more ingredients to the traditional avacado and salt, then simply mash them together with a fork. 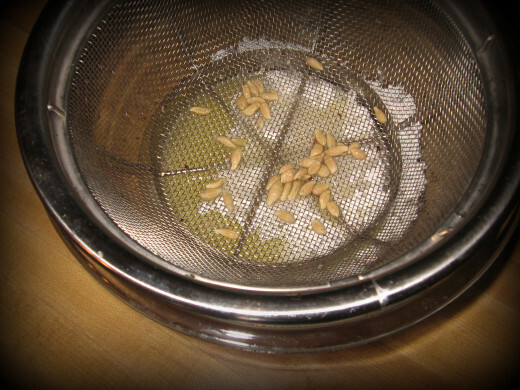 Mix salt, cumin, and cayenne together. Add. Fold in tomatoes, onion, garlic, and cilantro. Serve right away or keep in freezer for up to 3 months! Dice avacados and mash with lime juice. The lime juice helps the guacamole from turning brown. You may use less if you do not like the lime taste to come through in the guac. In a small bowl, mix salt, cumin and cayenne. You can always come back and tweak the amount of salt or cayenne later. Add to the avacados. Fold in onion, tomatoes, garlic, and cilantro. It is best to serve this right away or freeze for later! 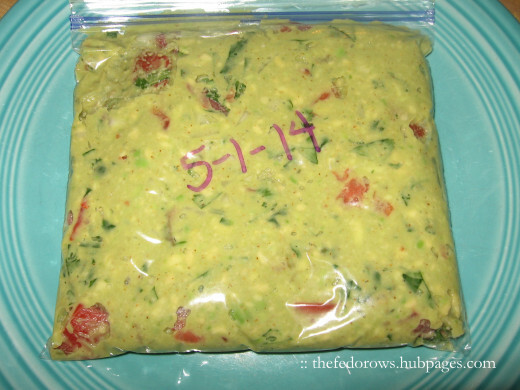 Freeze It: Yes, you can freeze guacamole! Put it in an airtight bag labeled with the date. Keep it in the freezer for up to 3 months. Let it thaw in the fridge or a lukewarm bowl of water. Be sure to eat it right away! 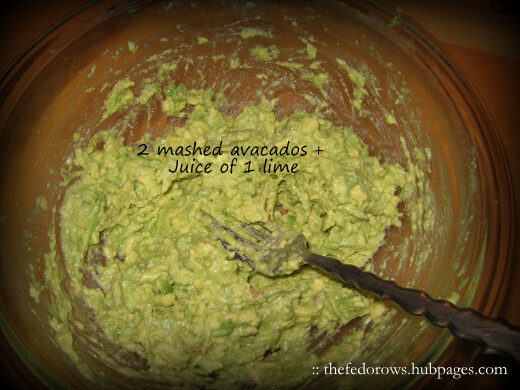 Lime Juice: To slow the process down you can add more lime juice to the surface before putting the guac in the fridge. I have not tried this. Pit: A friend of mine lived in Ethiopia. She ate lots of avacados there. Her Ethiopian housekeeper taught her to keep the avacado from turning brown by putting the pit in. I did this and it made my guac last for 2 days without turning brown! However, I have read online that other people claim this to be a myth. Perhaps it worked for me because my guac has lots of lime in it as well. Plastic Wrap: Place plastic wrap directly over the surface. I have heard this works pretty well, but some plastic wrap is not as airtight as others. Water: This is a new tip to me! I am excited to try it! The idea is that if there is a layer of cover over the guac it reduces its exposure to oxygen. 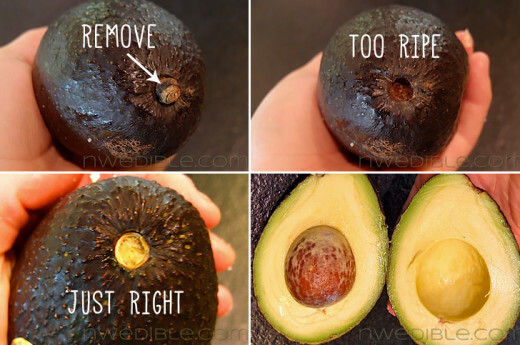 Cover the guac with about a centimeter of water before sealing in an airtight container. When you take it out of the fridge, simply pour the water out and re-mix the guac. It will be just as fresh as the day you made it! I am told this can extend the life of your guac for 3 days without turning brown! We have tacos, enchiladas, and fajitas throughout the year. So, for Cinco de Mayo, we switch it up a bit by making this fun recipe. 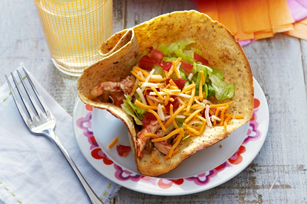 The tortilla bowls are definitely something we do not do during a typical weeknight! 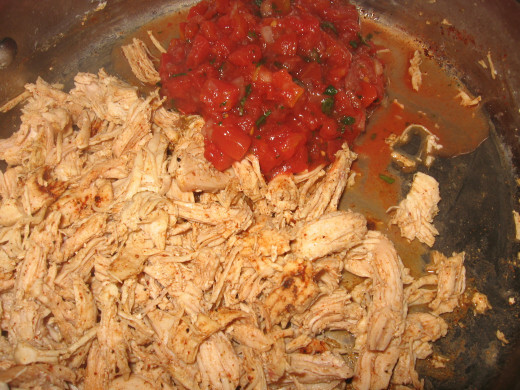 Chicken Tinga is a traditional Mexican dish made by combining shredded chicken and a rich chipotle sauce. It is my understanding that it is built by topping a tostada with re-fried beans and the chicken tinga. I have never had this before as I do not really care for chipotle peppers or adobo sauce. I know, I am sure I am missing out. Perhaps someday I will acquire a taste for it! Even if I did, it would be a bit rich for kids. 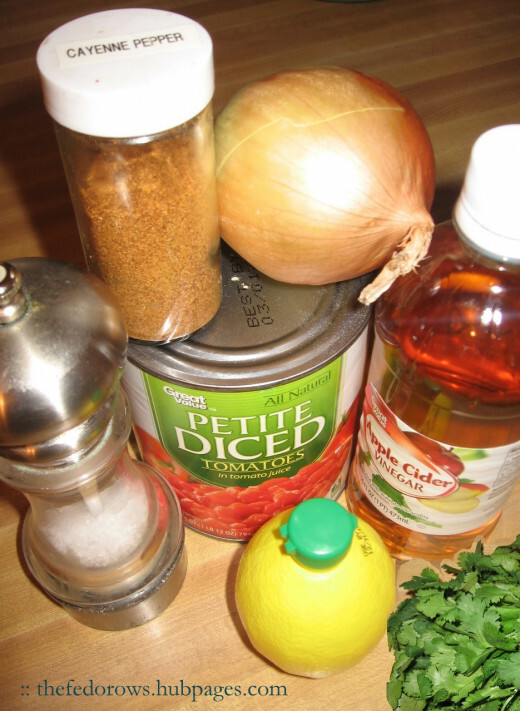 This recipe is different because instead of making the sauce, you use salsa. Great idea, huh! I have to give the credit to this to Kraft as it is not a family recipe. However, I can take credit for writing this recipe in my own words, adding the homemade salsa and black beans, as well as mixing the shredded chicken with some cumin and chili powder. It sure is yummy and family-friendly! Optional toppings: homemade guacamole, shredded lettuce, shredded cheese, sour cream, etc. If you do not have cooked shredded chicken already, cook 2 chicken breasts in water. Remove once cooked through and shred. The original recipe does not call for this, but I like to add 2 tsp cumin and 1 tsp chili powder to the cooked chicken. Then, mix in 1 cup of homemade salsa! Make 6 aluminum foil balls (or however many needed for your family) and place them on a baking sheet. The balls should be about 3 inches in diameter. This will use a bit of foil. 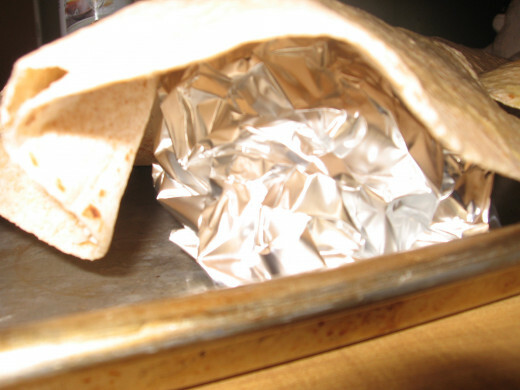 Put one tortilla over each foil ball. 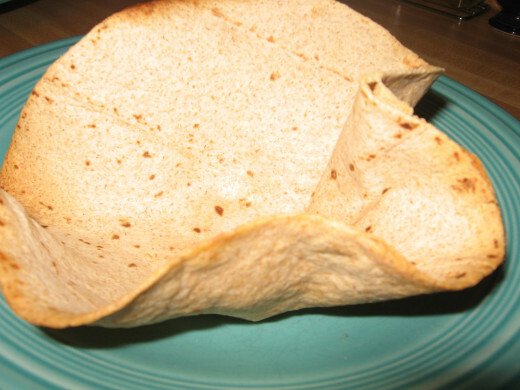 Then, spray each tortilla with cooking spray. Put them in your 425 degree preheated oven for 6 to 8 minutes. It is important to watch them to make sure they do not burn. 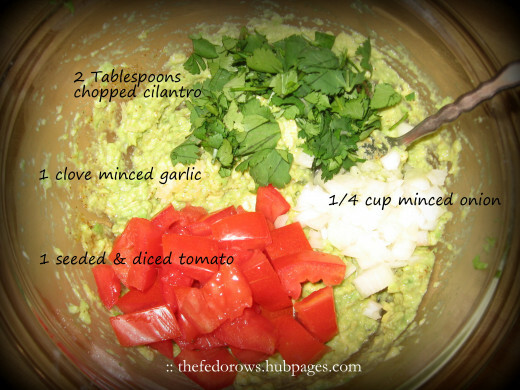 Meanwhile, prepare your toppings (for example: put guacamole, cheese, lettuce in bowls)! Drain a can of black beans and add 1/2 cup of homemade salsa. When it is time to eat, fill the bowls with black beans, "chicken tinga" and any other desired toppings. I like mine with some guacamole! 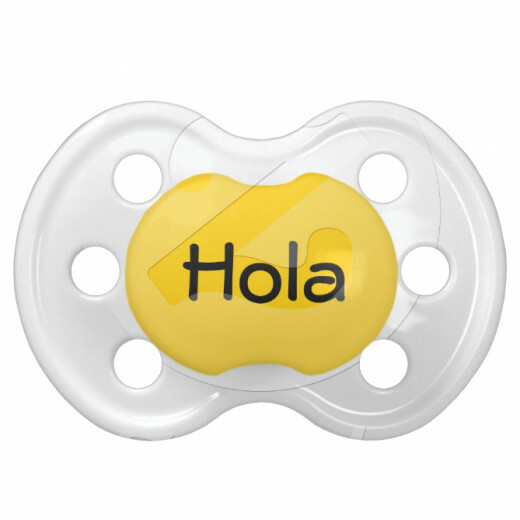 Since it is Cinco de Mayo, I used google translate to help me with this! 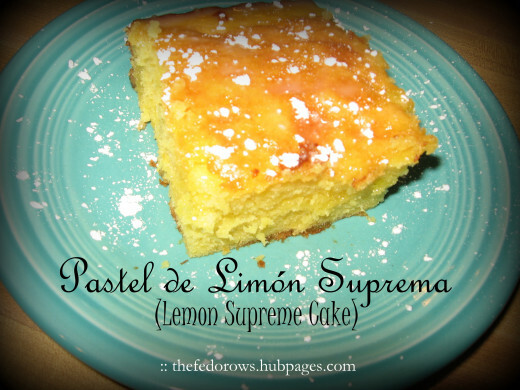 The original name for this recipe is Lemon Supreme Pound Cake. 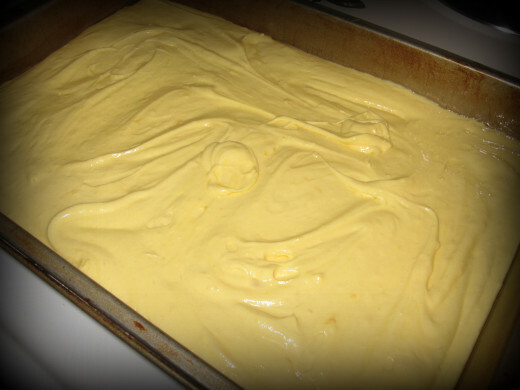 This is my Grandma's recipe, the same one who shared with me her amazing carrot cake with orange cream cheese frosting! 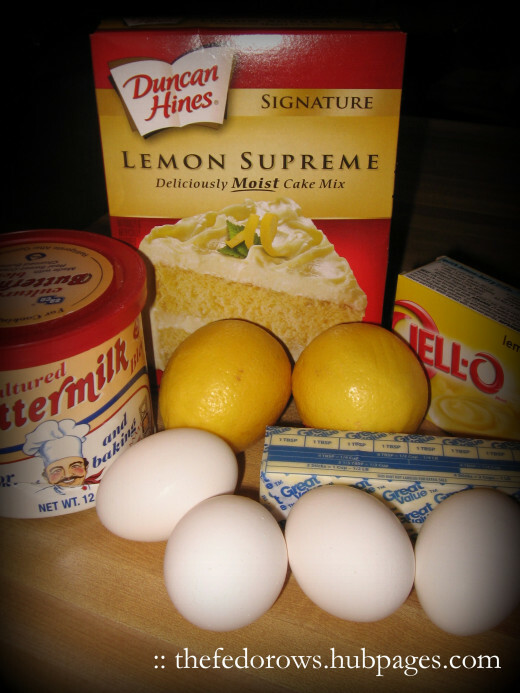 I have seen a similar recipe on the side of the Duncan Hines Lemon Supreme Cake box, but hers is a little more rich. 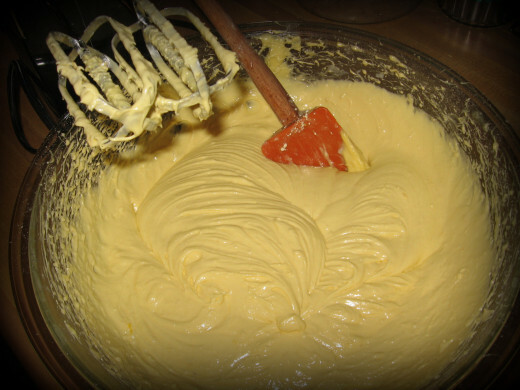 It uses buttermilk instead of water, butter instead of oil, lemon juice instead of milk, and real lemon zest. It may not be the most beautiful of cakes, but it truly does melt in your mouth and is a crowd-pleaser! You could fancy it up by baking it in a bundt pan. But, Grandma always made it in a 9 x 13 pan, so that's how I do it too! This is the zester I use! 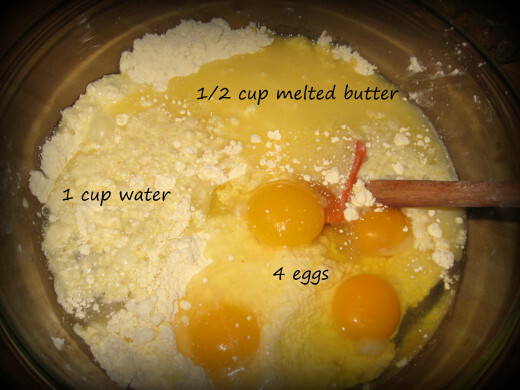 Add melted butter (or just use vegetable oil) and 1 cup of water (Note: You can use vegetable oil instead of melted butter. Also, if you are using real buttermilk do not add water. 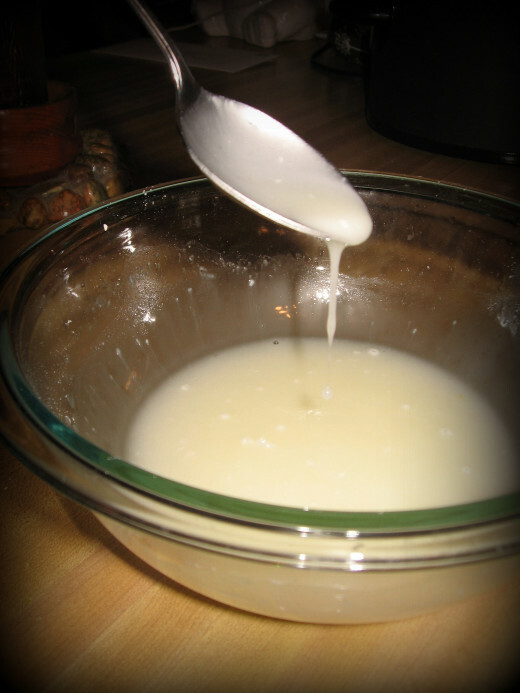 Simply add 1 cup of buttermilk now.). Grease 9 x 13 pan. Pour batter into the pan. 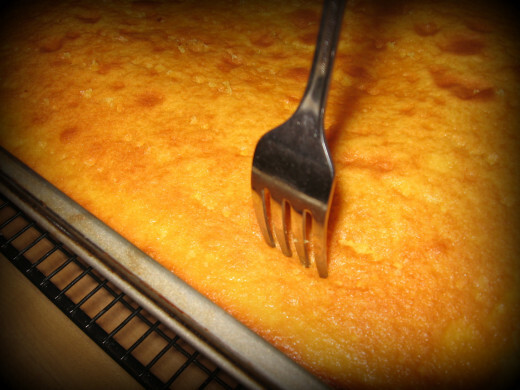 Bake in 350 degree preheated oven for about 30 minutes, or until toothpick inserted comes out clean. When cake is finished, prick with a fork. Let cool for about 25 minutes in the pan. While the cake is baking, prepare the glaze. 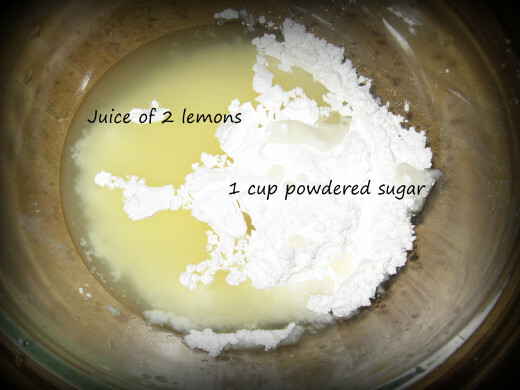 Mix fresh-squeezed lemon juice (1 1/2-2 T juice, about 1/2-1 lemon) with 1 cup powdered sugar. 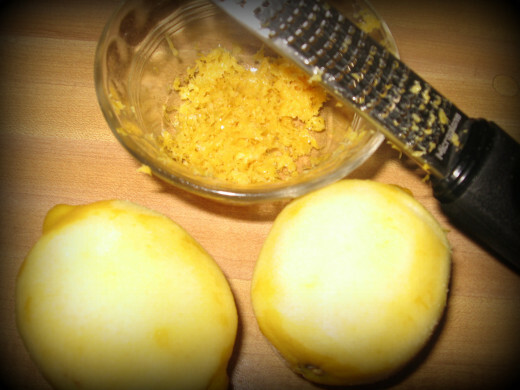 If you love lemon, use 1-2 whole lemons. 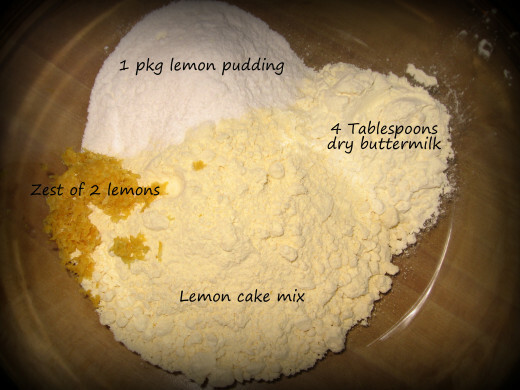 If you don't want the lemon to overpower the cake, use 1 lemon. 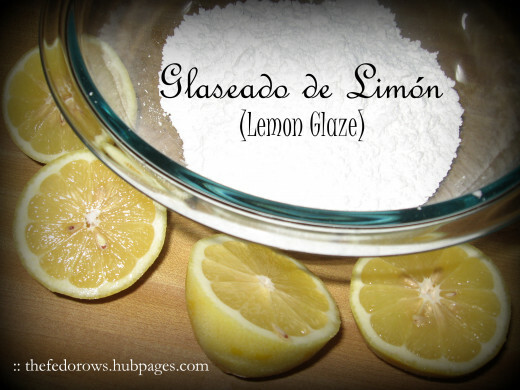 If you want a more subtle flavor, use just half a lemon. If you prefer none at all, simply mix the powdered sugar with 1 1/2 T water or milk. 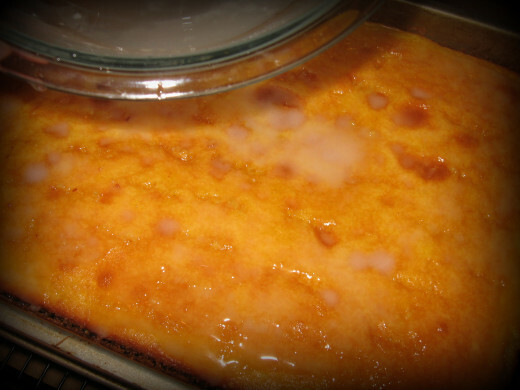 After the cake is done and has cooled for about 25 minutes, pour the glaze on top. Some of the glaze will drip in the holes and some will slide down the sides. That's okay! It makes the lemon flavor come alive! Cut and enjoy right away or store in the fridge for up to one week! Which of our Cinco de Mayo traditions are you interested in trying most? Thefedorows is an active contributor on Hubpages, an avid pinner, and blogger. 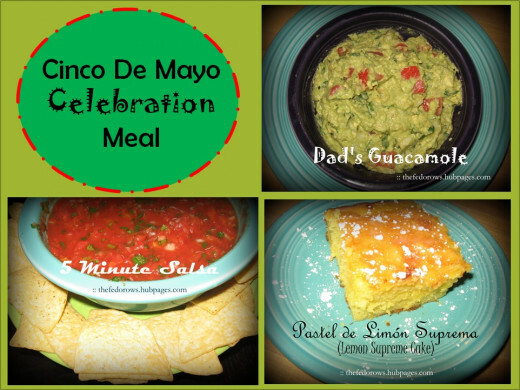 What Are Your Cinco De Mayo Traditions? Making papel picado, salsa, guacamole, chicken tinga bowls, and limon suprema cake make Cinco de Mayo special for our family. We can almost hear the upbeat mariachi music and the crunch of our chips dipped in some of that amazing salsa and guacamole! Mouth. Watering. Even if you do not have any Mexican heritage, Cinco De Mayo provides a day to expose yourself and your family to another culture. Why not start with something small? What are your Cinco de Mayo traditions? 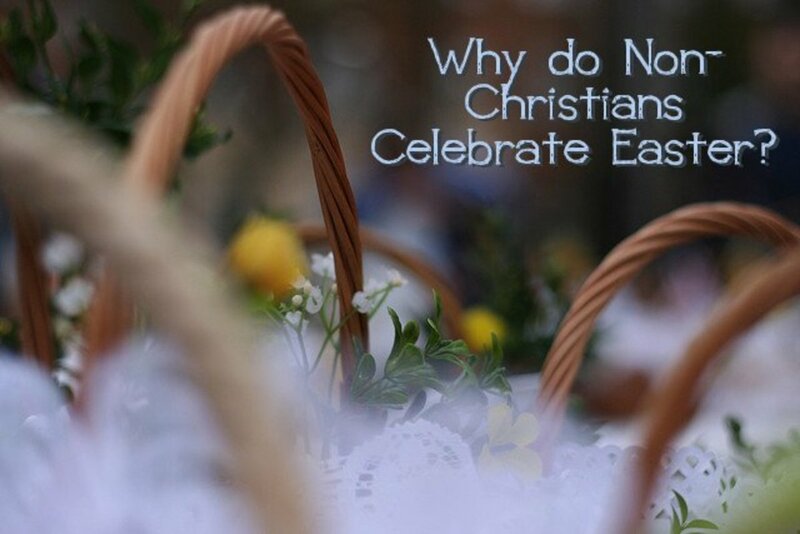 If you do not have any, what tradition might you like to start? We look forward to hearing from you! Muchas gracias! This hub was chosen as Rising Star on June 18, 2014. Thank you for your votes! Thank you, lunchboxer! I hope you enjoy them! Enhorabuena! Those are some great recipes! I can't wait to try them out! Thank you, Lizolivia! I find it helpful when other people put everything on one page rather than having to click on lots of links, so I try to as well! I am glad you appreciate it. Thank you for leaving a comment! Fantastic hub, everything's in one place. Thanks for the recipes! Hi Kate! Thank you for stopping by, again! The tortilla bowls are fun!